Killearn Acres, historically one of the top 5 selling neighborhoods in Tallahassee, enjoyed its best year of home sales since 2006. Situated on the Northeast side of Tallahassee and serving as the northern boundary of Killearn Estates, location and price are the benefits that annually attracts homebuyers. 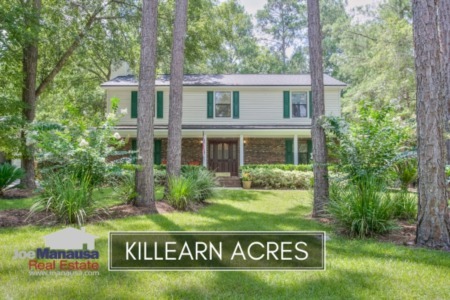 People are often surprised to learn that Killearn Acres contains more than 1,400 single family detached homes, so it's not just the little neighbor of Killearn but a vital source of three and four bedroom homes in the Northeast quadrant of Tallahassee. Today's home sales report for Killearn Acres includes graphs of the average home prices, home values, and home sizes, as well as a map of the current listings in the Tallahassee MLS and all past closed home sales going back to 1991. It is important to note that the narrative contained below is for sales through December for all previous years, but the graphs and the closed sales table will be continuously updated into the future (meaning bookmark this page if you always want to know the current status of homes in Killearn Acres). Average home prices were up more than 8% in 2015, but now are 22% lower than they were at the peak of the market in 2007. Low prices and low mortgage interest rates will continue to make Killearn Acres one of the top selling neighborhoods in Tallahassee. 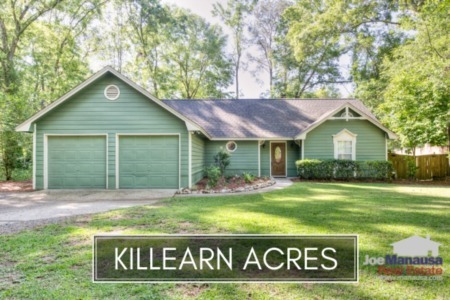 The average sales price of $164,000 for Killearn Acres in 2015 made it a heck of a value. Average home values in Killearn Acres remain fairly stable since 2012, never rising or falling more than a few percent. Looking forward, expect fewer short sales and foreclosures, so average home values are highly likely to rise. The average value of a home sold in Killearn Acres in 2015 was $101 per square foot. This is up 7% over the bottom reached in 2011, but still down about 25% from the market high set back in 2007. With values remaining so close to market bottom, buyers who purchase early in 2016 are likely to get the best deals we'll ever see moving forward in this popular NE Tallahassee neighborhood. The average home size sold in Killearn Acres typically falls in a range of 1,500 to 1,600 square feet, but 2015 saw buyers selecting the larger homes. In fact, the 86 homes sold in 2015 averaged an incredible 1,612 square feet, the highest average size ever recorded in a year. The following list shows home sales in Killearn Acres going back to 1991. I hope you enjoyed our January 2016 update on home sales in Killearn Acres, please feel free to drop me a note if you have questions not covered in this report.